Thomas Docherty is Professor of English and of Comparative Literature, University of Warwick. Previous books include: Reading (Absent) Character (OUP); John Donne, Undone (Methuen); On Modern Authority (Harvester); After Theory (Routledge); Postmodernism (Harvester/Columbia); Alterities (OUP); After Theory (revised/ expanded 2nd edn; Edinburgh University Press); Criticism and Modernity (OUP); Aesthetic Democracy (Stanford University Press). To be or not to be free, that is the question, the English question, the question of what is academic English at the beginning of the 21st century. 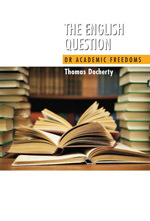 So argues Thomas Docherty in this new and important new study, a study that begins with the claim that the fundamental idea governing the institution of the University is a will to freedom. Tracing a history of the modern European University from Vico onwards and including Hume, Rousseau, Schiller, Hegel, Schopenhauer, Newman, Alain, Benda and Jaspers, the author argues the academy’s will to freedom is grounded in study of the ‘eloquence’ that has shaped literate and humane values. He goes on to explore the current condition of English as a literary discipline, arguing that literary studies is (or should be) a search for the unknown; and that in only that search can the academy establish the real meaning – or meanings – of social, political and ethical freedom. Thomas Docherty has taken on an enormous task. If his passionately argued and polemical study were entitled simply Academic Freedoms, it would be a book broadly about the ways in which a new managerialism is threatening the integrity of one of our oldest institutions, but it’s called The English Question and thus becomes a much more pointed discussion of the ways in which English – meaning ‘English Literature’ – is a distinctive discipline especially unsuited to new ways of accounting, auditing and marketing courses. If this sounds like special pleading, it is. Docherty, a Scottish Professor of English at an English University – Warwick – and leading theorist of postmodernism, is well placed to map out the relationship between liberty and the liberal arts, humanity and the humanities. If his title recalls ‘the Irish Question’, with its politics of partition and policing of borders, that’s fitting too, for Docherty’s work, in the tradition of Tom Paulin’s Ireland and the English Crisis (1984) and Robert Crawford’s Devolving English Literature (1992), crosses borders as well as disciplinary boundaries. A deceptively slim volume, The English Question is a busy, bustling book, bristling with an angry intelligence, and with a range of reference, from Augustine to Adorno, that can’t fail to impress. And yet it’s an intensely personal take on an ongoing debate. In this sense, and despite the title of the series in which it appears – Critical Inventions – it’s an intervention, frequently anecdotal and autobiographical, rather than a founding statement. Certain acronyms are a source of acrimony for academics. QAA (Quality Assurance Agency) and RAE (Research Assessment Exercise) are bound up in their minds with intrusive systems of monitoring, policing and scrutinising that interfere with the pure work of thought, or at least with the daily grind of reading, teaching and marking, adding another layer of bureaucracy to an already overburdened profession. According to Docherty, QAA is ‘a cancer that gnaws at the core of knowledge, value and freedom in education; its carcinogenic growth is now perhaps the greatest pervasive danger to the function of a university as a surviving institution’. Docherty sees the origins of QAA in the ‘culture of distrust of the public sector’ under Thatcherism. The stakes are high – the future of the public sphere and intellectual freedoms in an increasingly autocratic society – and so is the rhetoric, though riddled with moments of intimacy and insight. One or two instances give the flavour. Arguing against critics like Kate Belsey, who attack a monolith called ‘the Canon’, Docherty defends his own undergraduate education at Glasgow University as affording a rich diet of texts across historical periods, examined at the end of a four-year degree. This Docherty compares unfavourably with the current fashion for ‘modular’ courses assessed a month after completion, resulting in short-termism and strict adherence to course prescriptions, ‘usually anthologised’. In other words, new modes of teaching and examining mean students read less. (I would cite student poverty and quality of coverage as key factors behind the decision of many academics to teach by anthology.) Docherty warns we are losing the quality of literature to ‘quality assessment/control’, just as we’re sacrificing the quality of criticism to the requirements of the RAE. Behind The English Question lies the Scottish Question, the question of the Democratic Intellect, and whether a British Government will impose a three- year degree on Scottish Universities, just as a devolved parliament pushes for independence. Interesting times. Docherty offers a revealing anecdote. At a conference in Cambridge in 1998, Docherty invoked his mother, an early school-leaver with no qualifications, and enthusiastic consumer of popular writing (crime and romance), to make the point that those who incorporate genre fiction into their syllabuses in the name of democratising the canon were effectively affirming his mother’s exclusion from the privileged system that would allow her access to the cultural capital of high literature. Another participant, to general applause, accused Docherty of undervaluing, in a typical male move, women’s reading habits. A decade on, Docherty restates his case that new methods of assessment lead to dumbing down. Kelman shares Docherty’s disparaging attitude to genre fiction. It’s ironic to find working-class academics and writers on the side of literature in its classic form, against the teaching of popular fiction. ... Muriel Spark once remarked: ‘I think of the artist as a minor public servant. If he starts thinking of himself as a public master, he’s in trouble.’ Perhaps the same goes for academics? Spark, who admired managerial-speak while discarding dialect, would have had less difficulty with the theological foundation of universities, or with the daily drudgery of academics (as opposed to intellectuals). The English Question is a book that demands to be read, and deserves a wide readership, a book that, in these days of rising student numbers and plummeting staff morale, would start a fight in an empty classroom. Is the study of English literature passé, an archaic and irrelevant relic of an oppressive colonial society? As a professor of English at the University of Warwick, the author might be expected to argue for preserving English departments; but this work is more complex than that. Docherty is alarmed by the trend for universities to be governed by political and economic forces, and he wants them to evolve into places where controversy can thrive. He uses the study of English as an example but is really speaking about all departments, including the sciences. Many of his comments apply to the educational system of Great Britain, but the same struggle between teachers and administrators exists in the United States. After a look at the university over the past 300 years, he moves on to point out recent changes and the outside forces causing them, and lastly suggests improvements, both in the way English literature is taught and in the university as a whole. He quotes liberally from poets, novelists, statesmen and theorists to substantiate his proposal.